In this extract from her book, Jaime Levy discusses the four tenets of her UX strategy framework. A stellar user experience (UX) strategy is a means to achieving disruption in the marketplace through mental model innovation. Because what’s the point in spending time and energy crafting a digital product that isn’t unique? Or, at the very least, that's a much better alternative to current solutions found in the online marketplace? To achieve that disruption, we need a framework from which to connect all the dots that will build a cohesive UX strategy. 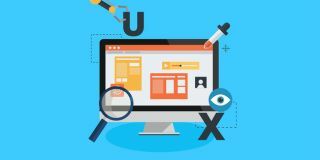 Here I’m going to break down the most important tenets that you need to understand in order to successfully implement the tools and techniques of UX. Think of it as a primer to get you and your team thinking like a UX strategist. The sticker on my laptop lid, reading "Disruptive innovation is the new punk rock"
In the digital world, strategy usually begins in the discovery phase. This is where teams dig deep into research to reveal key information about the product they want to build. I’ve always liked to think of the discovery phase as similar to the pretrial 'discovery' process used by attorneys in the United States. To avoid a 'trial by ambush,' lawyers can request to see the evidence of the opposing counsel in order to prepare sufficient counter-evidence. In this way, the attorneys try to avoid surprises. You, as a product maker, should also want to strategically do just that. Before that moment, my 15 years of professional experience focused on interface design and integrating new technologies (such as Flash) into interfaces to create 'cutting-edge' products. Often, I was handed a massive requirements document that listed hundreds of 'essential' features. Or, I was given a flimsy project brief with pretty comps that stated what the final product should accomplish. From there, I made a site or application map that catered to a specific set of user scenarios that enabled those interactions. Based on these documents, I could only infer whether my creation solved the problem or not because it was typically too late at that point to challenge the rationale behind the product vision. I was just supposed to design it on time and on budget. But in 2007, it was so fascinating to watch our UX director, Mark Sloan, get a dozen contentious stakeholders – no, Oprah wasn’t there – on the same page. Mark used consensus-building techniques such as affinity maps, dot voting, and forced ranking to help us understand all the different parts – content and critical functionality – that would make up the system we had to digitize. This discovery opportunity helped us (the stakeholders and product team) in examining our goals to make a better platform for the millions of devoted Oprah fans in the world. One week later, after all the workshops, the product team and I presented the discovery brief defining the product vision. The brief contained typical deliverables such as user personas, concept map analyses, and a recommended feature list. Because the stakeholders were anxious to get started, they immediately approved it. Our digital team was off and running on the implementation phase, which took over six months of emotionally fueled hand-offs. There were hundreds of pages of wireframes and functional specifications traded between stakeholders, designers, and developers. But the discovery brief was never referenced again. The personas and proposed solution were never validated by existing customers. The stakeholders went back to fighting for whatever prime real estate they could grab for their particular business units. Yet, there was something good that came out of that discovery phase for me: I was a UX designer who finally got a taste of what a UX strategy could potentially be. I was ruined. I couldn’t imagine just being a wireframe monkey anymore. A full year later, the redesigned site launched. I never looked at it because I had moved onto to another interactive agency with other high-profile clients. In my new position, I was able to focus my energy more directly on the discovery phase of projects in which user research and business strategy were given more weight. I also had a seat at the table to help shape the UX strategy and decide how a product vision should be implemented. I no longer had to feel fraudulent for spending so many waking hours building products for which I lacked a deep understanding of the customer segment and the business model. Today, I run my own practice that specializes in UX strategy, and since my first discovery phase, I’ve learned a lot about how to make it an iterative, lightweight, and empirical process of intense collaboration between stakeholders, designers, developers, and so on. Because when everyone shares a product vision, you and your team really have a chance at changing the rules of the game for your product, company, and future customers. However, I do want to acknowledge that my methodology is my version of UX strategy and might be different from other strategists. That’s precisely why I included Chapter 10 in my book, which contains profiles on people I respect who have been practicing it, as well. However, you’ll also see that we align on a lot of things. That’s what happens when a new discipline or methodology arises: people will find their own approach, but even within those differences, there are connective tissues that bind them all together to make UX strategy identifiable and unique. These are the four tenets that make up my framework. I have seen them in play every day since my first discovery phase. It’s not enough to understand your marketplace if you don’t talk directly to your customers. It’s not enough to validate that your product works if you’re not creating something unique. Good enough just isn’t good enough, and just identifying these tenets won’t be enough to get your team flying. You’ll need to understand how they interact and affect one another. Then, the real trick will be to keep all four of these tenet plates spinning in the air while you move through other techniques and tools. This is the start of chapter 2 from Jaime Levy's book UX Strategy: How to Devise Innovative Digital Products That People Want, published by O’Reilly Media. You can read the rest of this chapter for free on her User Experience (UX) Strategy website.